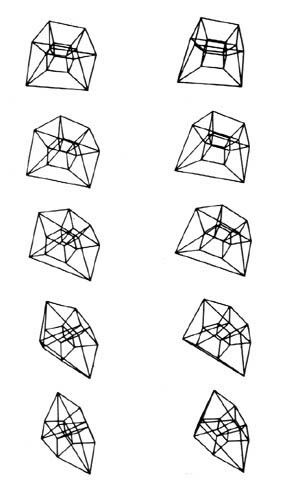 A. Michael Noll, Selected frames from movie of the three-dimensional projection of a rotating four-dimensional hypercube (1960s) In 2009 i delivered a half-hour speech on the history of memory corruption at kiwicon. The idea of doing a historical recap on this particular thread of security came from an observation that a significant amount of "hacker wisdom" was being lost to the sands of time. This has lead to the frustrating phenomenon of "new" research discoveries being presented that were (respectfully) merely adaptions or reproductions of older lore. Our community is obssessed with progress - new technology, new vulnerabilities, and new techniques. The respect of your peers is earned by giving new contributions to our ever-broadening understanding of computational insecurity - and rightly so. But in rushing forward so far and so quickly, we risk facing a loss of knowledge, context, and identity. With this happy thought in mind, here are some visuals for "a history of corruption". Enjoy!